Spiritual awareness is sorely lacking in most of the 7+ billion people on earth. It’s an obvious reality and it’s not hard to understand why. The spiritual realm cannot be seen, smelled, tasted, touched or heard — all these sensations belong in the material realm, not the spiritual. However the only way we can learn about the spiritual world is through the senses. That makes for quite a paradox that can only be solved in one way. The only way mankind can learn about the spiritual world is through the five senses. That requires information to be passed down to us from the spiritual world in the form of sensory impressions. Most sensory impressions can be difficult to interpret, so to provide concrete facts that cannot be misinterpreted, the best way to convey that information is through words we understand and use all the time. Words are the principal method God uses to communicate information about Himself and the spiritual world to mere five-senses constrained humans. God’s Word is a collection of words God communicated to men so that mankind could learn about Him, the spiritual world and how mankind interacts with it. But to communicate to man God had to provide the mechanism by which spirit could communicate with human beings. God constructed man in such a way that man’s brain can interface with spirit. God simply puts his spirit “upon” a person and that allows communication to take place. But that communication still has to be in the form of sensory impressions supplied to the brain. Those sensory impressions are made primarily using words and images, When you read the Old Testament you’ll find many men that God put His spirit upon. These were the “prophets” of God. A prophet is one who speaks for God. To speak for God one has to hear from God. This is done in the manner I just described. I have to provide a caveat here. God can communicate to a person who does not have His spirit upon them but He still does it through the five senses. God even had a donkey speak His Word to the false prophet Balaam. Clearly the donkey didn’t understand words, but God made him speak what God wanted to say. Balaam received those words, those sensory impressions, through the sense of hearing, showing again that God communicates to man through the five senses. Once we understand that, it’s easy to see why mankind is so ignorant of spiritual matters. God’s Word has long been around but how many have sought the knowledge it presents? How many more have ignored it willingly? How many more have never even heard or read it? We’re talking about multiple billions of people in disparate parts of the world, many of whom have never even heard the “gospel of salvation.” The more I speak with people about it the more I’m convinced that very few really know and understand God’s Word, even in Christian circles. I’m so sad to say that I well up with tears in my eyes and a heavy heart because the knowledge of God is there for the taking. God made known what man needs to know but few pursue it. 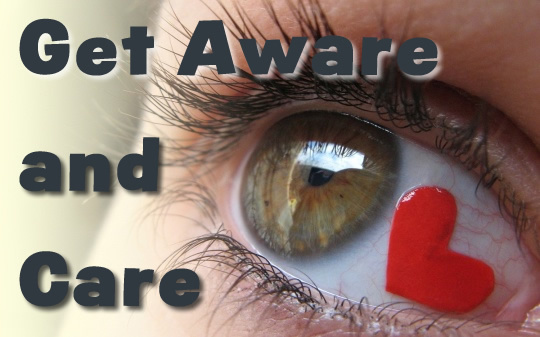 My message to you today is that it’s time to get aware and care. First, get aware of what God’s will is. Next, care about yourself and others enough to respond to God’s Word and to share the knowledge it contains with others for their own good. The first thing to do is to learn God’s Word. That takes reading it, but more than that. I’ve demonstrated the fact that people miss so much when they read God’s Word that it’s hardly worth their effort to read it. I’ve met people who have said, “I read the Bible!” as if that was an accomplishment in itself. I’ll ask the person who has stated they’ve read God’s Word something like, “What does God say a person has to do to be saved?” Invariably the answer is along the lines of, “…lead a good life…” or “live righteously.” Friends, God wants us to ‘be good’ but that isn’t what saves a person. Even though they read the Bible, they didn’t learn what God says in it. The Bible is a big book comprised of 66 individual books. It was translated from Hebrew, Chaldea and Greek into English and other languages. Most words do not have a direct counterpart in a different language, so translators had to use the closest word or words they could find to translate into another language. Add to this the fact that most of the translators were already subscribed to a set of beliefs taught by their particular denomination and you find many, many words were mistranslated because the translators leaned on their own belief system in order to translate difficult passages. Yes, there are thousands of errors in any translation you pick up today. King James First people will argue with me that that is the only ‘perfect’ translation. How little they have done their homework. The second edition of the King James version corrected over 100,000 errors in the original version. Did you know the original King James version included the Apocrypha? Were you aware that the original version had a long preface written by the translators that set forth their methodology for translation and also included information about their struggle with many words and passages? The original King James version of the Bible also had copious notes in the margins all the way through it. Those notes contained alternate readings for words and verses they were unsure about. However all those notes were dropped in subsequent editions because those who manufactured those subsequent editions felt people would get confused and discouraged when they saw how many alternate readings there were. Valuable research was simply dumped to make readers feel the translators did a ‘perfect’ job. If you really want to learn God’s Word you’re going to have to study it. You’ll have to commit time and effort to the task and you’ll have to use concordances, interlinears, word study books and other Biblical research materials. “That’s too much work — I’m not a scholar,” you may think. It’s true that not everyone is able to study God’s Word as it should be studied, due to time constraints or lack of skill. This is understandable and I agree that not everyone is capable of solid Biblical research over a long enough period of time to get to the real truth it reveals. But fear not! That’s the very reason God gifted and provided teachers for those who want to learn but need help. God has provided teachers and I am one of those. I have studied God’s Word intently over quite a number of years; I spent 10 years alone just doing word studies, mainly in the New Testament. That doesn’t make me an expert but it did give me a solid foundation from which to do further research. To help others learn how to study the Bible fro themselves, and to share what God has shown me in His Word, I’m actively engaged in providing an online platform people can use to discover God’s Word for themselves. It’s called Live Faith TV and over the next few months and beyond I’ll be putting together a team of people to help gather information and put it up for others. I’m forming a “Biblical Research Team” and you can be part of it if you want. You’ll be taught all the skills you need and you’ll be only be delegated tasks you are able to handle. You can go as far as you want, participate as much as you want, or as little as you want or are able. Everybody can contribute something to this knowledge base and without the help of others, I’ll never be able to get the work done myself. Here’s your invitation to join in on the Live Faith TV Biblical Research Team. For more information, click the link and visit the site. At the time of this writing there isn’t much there because this concept and work is just in its infancy. I’d be overjoyed to have you involved in some small — or big — way. Get aware of what God’s will is. That’s the first step. The second is next. Once you learn God’s Word, ingrain it into your heart and life. Out of the heart come all the issues of life. Care about what God says in His Word. Care about others enough to share what you are learning with them so they can benefit from it. If you keep it to yourself, only you will benefit form it, and if this is what you do, you won’t even benefit from ti as much as you could. God wants us to share His Word and His love with others. He gives rewards for doing so, believe it or not; that’s how much He wants us to live it and share it with others. Let’s let God’s Word speak on this so you understand it and can therefore act on it. I Corinthians 3:10-15 According to the grace of God which is given unto me, as a wise masterbuilder, I have laid the foundation, and another buildeth thereon. But let every man take heed how he buildeth thereupon. There you have it. Take God’s Word for it, not mine. The opportunity has been plainly laid out. Don’t worry about that ‘fire’ verse — works that aren’t ‘good’ will be burned up, not you! Those works that you do that stand the test of God’s holy fire, you’ll receive rewards for. It’s that simple. If you take time to learn God’s accurate word first, and you “play by the rules,” then you’ll have an abundance of rewards at the return of Christ when your works are tried by fire. If you run out and do a bunch of works without learning God’s Word, you can bet those works will be ‘burned up’ — they won’t stand the test of fire that our Lord Jesus will put those works through. When you care about God and what He has to say, you’ll share His Word with anyone, even if they don’t care. When the truth of God’s Word wells up within you, there is no way you can keep it in. You speak out of the abundance of your heart. Everything you do is out of what’s in your heart. You don’t believe me? Let’s go to God’s Word and see if what I’m telling you is true or not. There it is. Take God’s Word for it, not mine. When you care, you share, it’s that simple. I hope I’ve effectively communicated to you why there is so little true knowledge of the spiritual world. I hope you can see why it’s so essential that you study God’s Word for yourself rather than taking someone else’s opinion of it. I’m not here to offend anyone, and offense lives in the one offended anyway (that is a big lesson to learn by the way); I don’t care if the person is your best friend, a relative or a pastor or other leader in the church. Position is no guarantee for truth and neither is relation or friendship. The only guarantee for truth is God’s Word and you need to learn it yourself, not take another person’s word for it. Finally, share that part of God’s Word that you absolutely know is true beyond the shadow of a doubt. If you aren’t sure about something, just say so — don’t feign that you do to impress someone or to make yourself look smarter. Be honest in your communications and you’ll find people trust you much more readily. Care about God and His Word enough to be honest with God and others. God will fill you with the knowledge of His will as you keep Him first. Seek the Kingdom of God first and all these things will follow. Thank you for taking the time out of your busy day to read this. Let God’s Word sink into your heart and act on it. It’s time to get aware and care, don’t you think?